The four-station powered polarizer plugs into any 110 VAC outlet to continuously polarize up to four sensors at 675 mV. This polarization module has an additional terminal to check the battery of a single station polarization module. All DO sensors may need to be polarized for 6 to 8 hours prior to calibration and use. 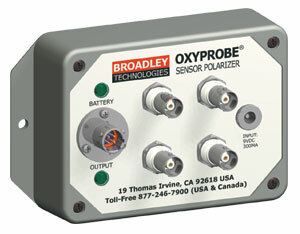 Polarization modules allow the sensor to be polarized without tying up a transmitter. These units are not autoclavable. The Broadley -James four-station powered polarizer has been improved by changing the connector inputs from banana plugs to BNC jacks, which are simple and easy to use. The new design allows for more secure connection of the DO sensors to the polarization module. Four cables are included with each box. Each cable has D4 twist-lock coaxial cable plugs to connect to the DO sensor, and BNC plugs to connect to the polarizer.